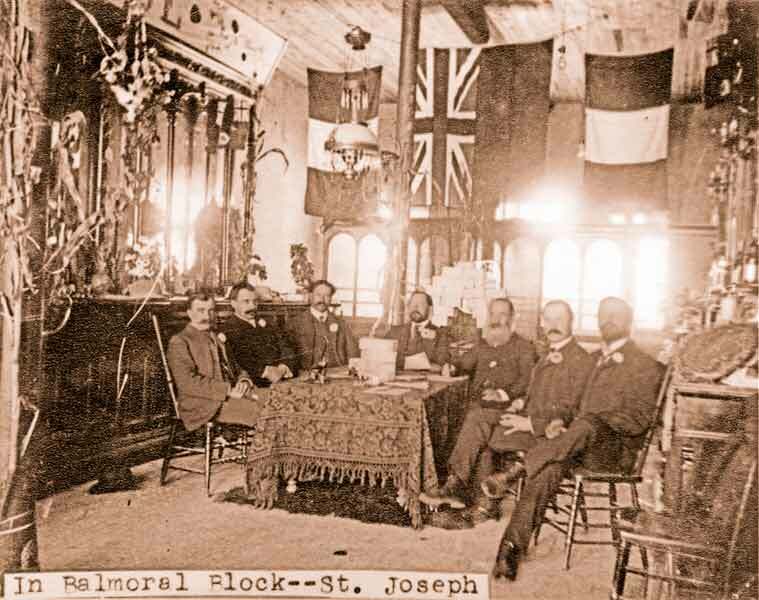 Narcisse Cantin, St. Joseph’s “developer”, used his own money and that of investors’ to buy the entire town-site and created what must be one of the first planned communities. Cantin would not allow any small building constructed that was not in keeping with the other buildings on the town site. He invested much of his personal fortune in the development of St. Joseph, which he considered the first step in achieving his prime objective, a deep water canal system to Lake Erie. Streets were named after local residents and investors, with lands adjacent to the creek and along the bluffs reserved as parkland. Park Avenue, a gravel road extending from Lake Road (Highway 21) to the lake, was to end with a 12-acre public park. The park would be complete with a recreation area, with areas set aside for cricket or baseball, and extend down to the beach. Further public infrastructure would include the construction of a dock, wharf and secondary facilities and buildings associated with a port. As the planned Lake Huron terminus for shipping making its way from Lake Superior to the Atlantic Ocean by way of canals, St. Joseph’s harbor facilities were crucial. St. Joseph was to be the capital of the entire Great Lakes seaway. Cantin’s plan also involved populating St. Joseph with expatriate French Canadians who had migrated to Chicago. To attract them to St. Joseph, he promised employment in the proposed manufacturing firms, docks, warehouses and in the canal construction itself and a summer resort. St. Joseph’s construction projects alone employed between 50 and 100 people, many of them local farmers. By 1903, about 300 people were living in St. Joseph. A small brick and tile yard with a single boiler for one kiln was established and run by a Mr. Foster. The compact mixture of lacastrine (silt lake deposits) and glacial clay that formed the lower part of the nearby gully provided the raw material for the brick yard. Later, a second brick yard, owned by Oliver Cabana Jr., was established with three large kilns. Oliver Cabana Jr. was one of the Buffalo capitalists Cantin had influenced during the years he spent in Buffalo. Cabana was an industrialist and chairman of the Greater Buffalo Liberty Bank. There is some evidence that Cabana also partly financed the Novelty Factory. In 1897, a saw mill was in operation with a capacity of 10,000 board feet per day. Managed by Fred Belanger, it was owned by Cantin. This sawmill was possibly the old Johnston’s saw mill, later owned by Henry Hayrock and ultimately by Cantin. The saw mill was challenged with a lack of timber, which Cantin resolved by rafting timber down the lake from northern Ontario. A lumberyard operated by George Campbell had developed from its small beginnings under Cantin’s ownership. By the late 1890s, the Queens Hotel operated by two Vallée brothers from Montreal was enjoying a good trade. The hostelry and tavern was owned by Aldéric Raymond of the same Raymond family that owned Montreal’s Queens Hotel and Windsor Hotel (see also Windsor Hotel). It is likely the Lakeview Hotel was renamed the Queens Hotel. The New Balmoral Hotel, at the corner of Highway 21 and 84, was constructed by Narcisse Cantin from 1897 to 1907. The three-story hotel, built in a pseudo-Moorish style, cost $250,000. Financing came from the Vallée brothers and perhaps Cantin as well. Cantin planned the hotel would form the nucleus of the community’s summer resort. The Balmoral could host 200 guests and offered an 80-foot bar carved in cherry wood, electrical lighting, beautiful glass chandeliers and hot and cold running water. Cantin stated it would serve the best imported and domestic wines and liquors. Furnishings were brought in from the Balmoral Hotel in Montreal, which had been a luxurious establishment but was being dismantled. In addition to luxury amenities, The Balmoral would offer yachting, fishing, bathing, golf, riding and tennis. The Balmoral was advertised in many large eastern American cities and in Montréal and Toronto. It had a head office in New York, located in Room 303 of the Cambridge Building on West 33rd Street. Advertising mentioned fine roads for automobiles and carriages converging form the north, south and east of the hotel. Prospective patrons from New York City were told to take the 6am train from Grand Central Station heading for Hensall, Ontario by way of Buffalo. Arriving at Hensall at 4:52pm the following afternoon, they could then travel by coach or automobile to St. Joseph. Promotional materials exaggerated the hotel’s associated activities and facilities, but the lake and beach were very real. The Balmoral never opened, although it stood for 20 years. It was demolished after World War One. The windows and some of the furnishings are displayed in the Huron County Museum in Goderich. One exceptional business was an organ factory, opened by Oliver Bissonnette of Montréal, who had worked for S.R. Warren and Son, pipe organ builders of Toronto. Bissonette soon bought out Canada’s only other two pipe organ companies. Bissonnette also operated a winery and a brick factory. Opened in 1897, the Novelty Factory produced everything from glue to hair curlers. The foundation of the factory was made from local beach. Its construction employed between 50 and 100 local people, plus several teams of horses.